Although this lively figure study dates from an early stage of the artist's career, the signature and inscription identifying the model were added considerably later. The sheet at one time bore the mark of the Destailleur collection (Lugt 740). PROVENANCE: (?) Collection of the architect Hippolyte Alexandre Gabriel Walter Destadleur (1822-1893); (?) Destailleur sale, Paris, June 7-8, 1901, lot 116 (as "Portrait de jeune Femme, assise et tricotant." 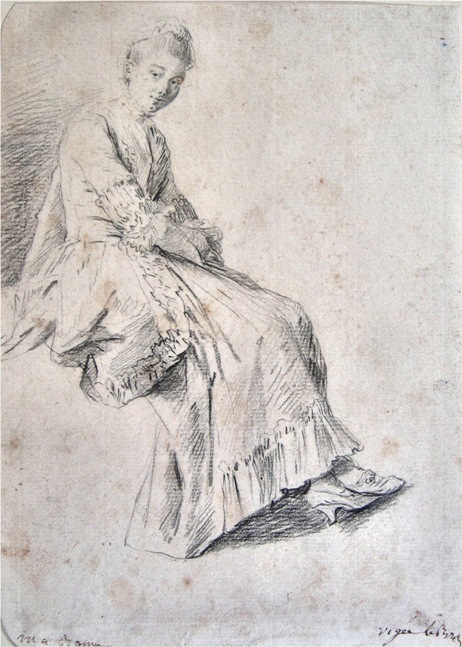 Sold with a pendant, lot 115: "Portrait de Femme, assise et brodant. Au crayon noir et A la sanguine. Signe. "); (?) anonymous sale, Paris, March 10, 1902, lot 91.